With the advent of the internet, it has become so much easier for scam artists and con men to reach into the wallets and accounts of good hearted people world-wide. Of course, scams that use a real-life tragedy as a means to do so are nothing new. 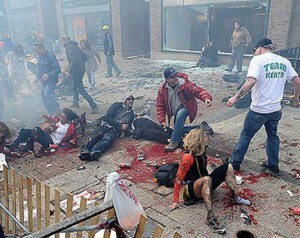 The 9/11 attacks, the Indonesian Tsunami, the Japanese earthquake and subsequent Tsunami and now even the bombings at the Boston Marathon. The recent news of these tragedies, together with the scam artists’ promise via email or online links to deliver some new video, pictures or whatever they promise means it is more likely that people who want to help will click that link or open that email. While some of these scams are about gathering your financial information, or charging your credit card to drain your bank account, more of them are about placing a worm or Trojan horse on your network to track more than just your financial information. This information is used to steal identities, create entire credit profiles and purchasing goods under your name. The malware that is installed on your computer when you click on these links may sit dormant for some time. The latest threat to your cyber security is from a page entitled, “Hot News: Videos of Explosions at the Boston Marathon 2013.” While some of the links in this message lead to legitimate You Tube videos, at least one of them leads to a malicious page where the malware installed attempts to connect to IP addresses in the Ukraine, Argentina, and Taiwan. Each of these nations is known for the large concerted efforts of individuals and companies to attack the computer networks of other countries. The important thing is to have the security of your network and computer increased and regularly updated to deal with these problems. Remember that there are safe, legitimate sites to find links to news and videos on the most recent of tragedies to be exploited by a group of soulless cyber criminals.